Marcus Foster led K-State with 15 points, but Kentucky's Julius Randle had 19 points and 15 rebounds to lead Kentucky to a second-round NCAA win. ST. LOUIS — Julius Randle had 19 points and 15 rebounds, Aaron Harrison finished with 18 points and No. 8 seed Kentucky held on to beat Kansas State 56-49 on Friday night to earn a date with top-seeded Wichita State in the NCAA Tournament. The preseason No. 1, Kentucky (25-10) is finally starting to live up to the expectations that came with its heralded recruiting class. John Calipari’s bunch nearly knocked off Florida in the SEC title game last week and seemed to carry that momentum right into the Scottrade Center. Now, the question is whether it will continue on Sunday. The Shockers, on the top line of the Midwest Region, rolled over Cal Poly to improve to 35-0. Marcus Foster had 15 points, Shane Southwell scored 11 and Thomas Gipson finished with 10 for Kansas State (20-13), which started in a 1-0 hole after a technical for a dunk in pregame warm-ups. The No. 9 seed then struggled to hit from the perimeter against Kentucky’s tall lineup. Kansas State was just 5 of 21 from 3-point range. Foster was 1 of 7. The victory is the start of what Kentucky hopes is an NCAA Tournament of validation. The team stocked with highly recruited freshmen has been criticized for failing to live up to lofty expectations, losing several times to overmatched and undermanned opponents. Of course, all of that becomes moot when the NCAA Tournament begins. Kentucky has won 21 of its last 22 games to open the dance, when the lights are brightest and the games mean the most. 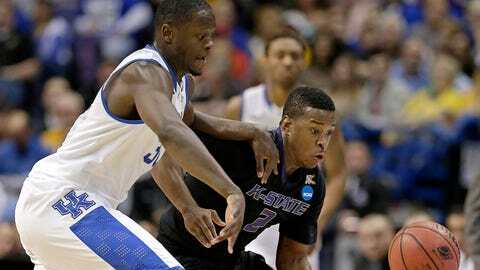 Meanwhile, Kansas State was in trouble even before its tournament began. Sophomore walk-on Brian Rohleder, who played only 31 minutes all season, earned a technical foul for that pre-game dunk. NCAA rules prohibit dunking with less than 20 minutes until tip, and Rohleder’s dunk came with 19:58 showing on the clock. Andrew Harrison made one of two free throws while fans from both schools showered the officials with derision, and Kentucky led 1-0 when the game finally started. The SEC Tournament runner-up built on its advantage through the opening minutes, the Harrison twins each knocking down a series of outside shots. Kentucky pushed the lead to 29-17 with 2:23 to go on Randle’s basket, but Kansas State answered with six straight points to end the half. Bruce Weber’s team trimmed the lead to 35-33, only for Kentucky to regain control when Southwell was hit with a technical for arguing a no-call on a drive to the basket. Kentucky stretched its lead to 44-36 midway through the second half, and whenever its rival Wildcats threatened to get closer, Randle was there to answer the call. The bruising forward stuck back a miss to make it 46-38 with 8:02 remaining, converted a three-point play a few minutes later, and then scored again at the rim for a 51-40 advantage. Kansas State closed to 55-49 on Foster’s off-balance 3-pointer with 24 seconds to go. But a team that replaced most of its key players from a season ago and defied expectations all year eventually ran out of time on its comeback bid.